A month ago leaders from three major labor unions, Teamsters President Jimmy Hoffa, UFCW President Joseph Hansen and UNITE-HERE President D. Taylor, wrote a scathing letter to the Obama administration about how Obamacare will destroy the 40 hour work week for hardworking Americans. The letter called for the administration to "fix" what was broken and had a strong tone of regret when it came to supporting President Obama and the re-election of pro-Obamacare Democrats. 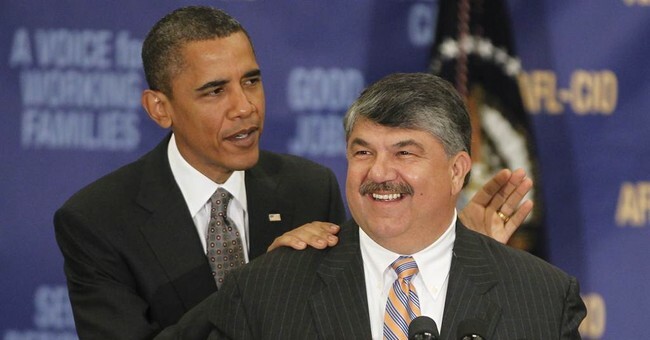 Now, the AFL-CIO in Nevada has passed a resolution to openly criticize the Obama administration over Obamacare, again stressing the situation needs to be fixed by the very people who created it. The resolution is a result of union concerns being ignored. Signaling a growing rift between some unions and the White House over the Affordable Care Act, the Nevada State AFL-CIO passed a stinging resolution Wednesday that criticized the administration for its handling of their concerns with the health care reform law. The resolution claims the law could end up "destroying" the unions' multi-employer health plans if the administration doesn't come up with a regulatory fix. "[O]ur union members and their families originally offered strong political and moral support for the promise of the Affordable Care Act because it would expand health care coverage for more Americans," the resolution read. But when it came to dealing with the unions' concerns, "the Administration has postured on proposals to address the problem, but no proposal to date will actually solve the problem. Our health plans only get worse." Other unions, like UNITE HERE, have reportedly been in talks with the White House that haven't been going so well. In an interview, UNITE HERE President D. Taylor said the union has been in talks with the White House and the Treasury Department over how Taft-Hartley plans should be interpreted under the law. According to Taylor, if workers under Taft-Hartley plans aren't eligible for subsidies, employers will see little reason to remain a part of such plans down the road, potentially forcing workers to purchase their own health care on the state-run exchanges, which are unlikely to offer so much coverage at such low rates. "We've been working for over two years with essentially all aspects of the government, including Treasury, which wants to interpret [Taft-Hartley] as an employer plan, and it's not," Taylor said. "The Affordable Care Act has clearly been devised so that it would make our nonprofit Taft-Hartley plans completely uncompetitive." "We want to hold the president to his word that you can keep the plan you like," Taylor added. Meanwhile on the economic front, we're seeing more and more companies cut hours and the overwhelming majority (more than 70 percent) of new jobs being created are part time.